Anchor supports Web Distributed Authoring and Versioning (WebDAV), which is an extension of the HTTP protocol. WebDAV is another way for end users to view and edit documents–both personal and through team shares–located in the cloud. While Anchor can be configured for WebDAV support, you might notice a few limitations when working within Microsoft Office documents. Specifically, end users might be prompted to log in each time they open or save a Microsoft Office document in a mapped drive. While the Anchor support team cannot prevent Microsoft Office from prompting for credentials, it is possible to configure Microsoft Office so that end users do not have to enter credentials each time they open or save documents in a mapped drive. IMPORTANT! These instructions have been tested on a Windows 7 machine; this approach might not work with other versions of Microsoft Windows. Additionally, at this time, there is no known workaround for Mac operating systems. Note: For more information about configuring WebDAV, please reference the Mapping a Drive Using WebDAV article. From the end user’s local machine, open the Control Panel. The Control Panel displays. 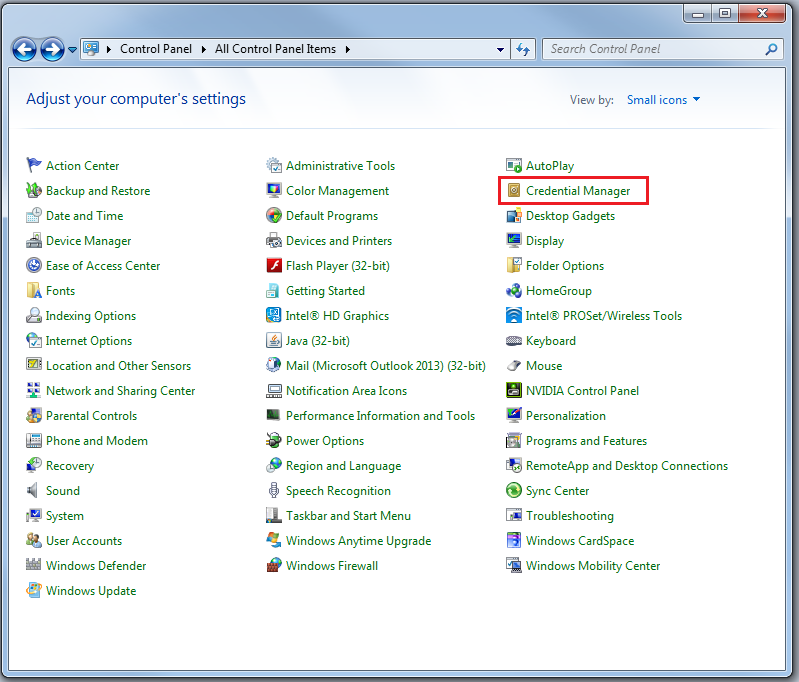 In the Control Panel, using the Small Icons view, click the Credential Manager link. The Credential Manager window displays. 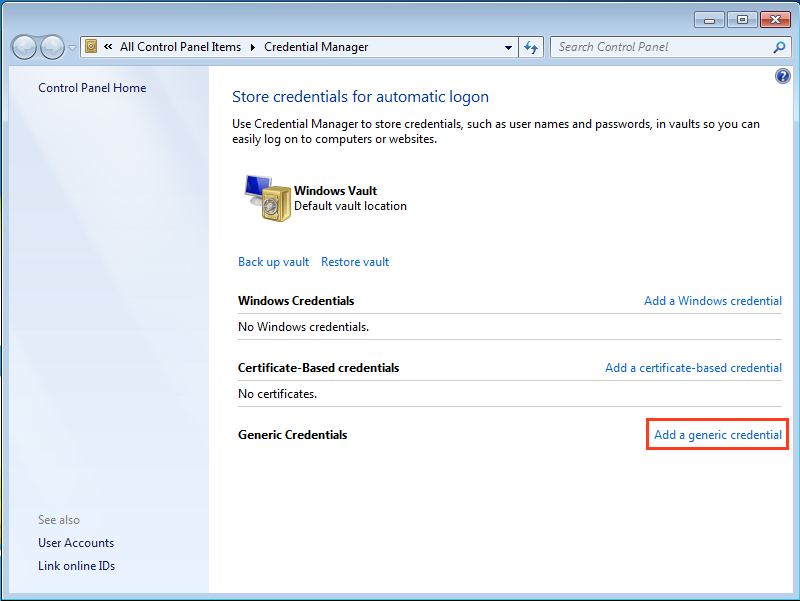 In the Credential Manager window, click the Add a generic credential link. The Add a Generic Credential window displays. 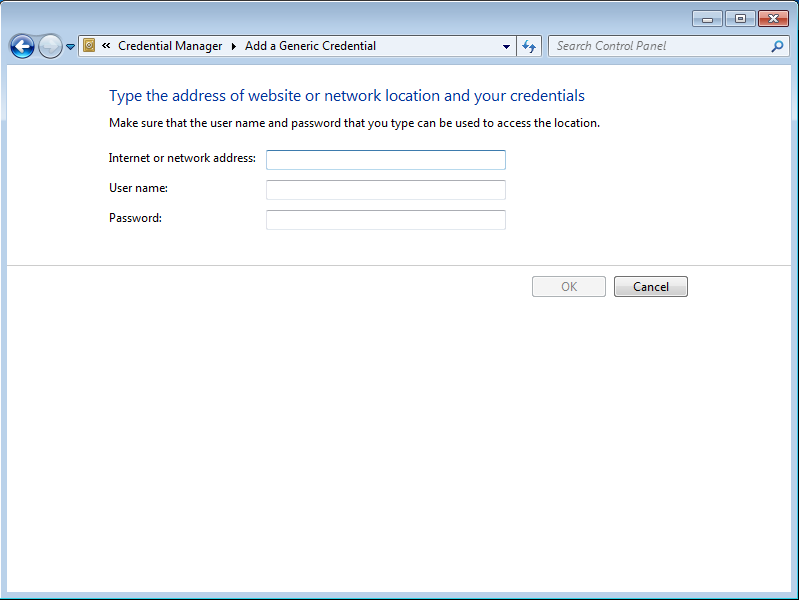 In the Add a Generic Credential window, enter the end user’s credentials. In the Internet or network address field, enter the following URL for SaaS environments: https://dav.syncedtool.com (for private cloud, enter your hostname). In the user name field, enter the end user’s login name. In the Password field, enter the end user’s password.